An Anglo-Indian in Love by Tapan Ghosh is a short love story with terrific intensity and strong cultural backdrop of Calcutta of the 1950s. The story is of Dilip and Cindy. But is it going to be a smooth sail? We need to find out that. 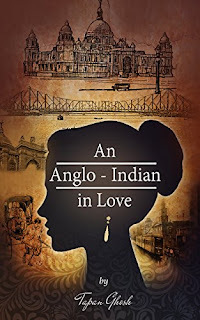 The running time period in the story is just after the independence, and that time Calcutta was a major hub of British India for many reasons, thus the place was laced with diversity. Local Indians, White people, and Anglo-Indian were common yet prominent. However, there are clashes between them with reference to culture, religion, colour, and race and so on. So, among these clashes a love story is possible between two people, who not only differ in age but also in culture and religion. The lead characters of the novella are Dilip and Cindy. The former is a young man known as Dada for his ferocious and boldness in the society. Many support him as they think him as modern-day Robin Hood, on the other hand many, especially white people, looks him down as a hooligan. Dilip has good personality and presence in the society, for instance he fights in the support of poor, and helps the local politicians in achieving their feat. When Dilip happened to come across Cindy first time, love at first sight was imminent. Though Dilip is much younger to Cindy, yet they both feel connected and fall in love. That time in India, age gap and cultural gap was a big thing for a couple in love. Moreover, Cindy is married to an abusive and racial man Bert, who consistently harasses her. Will they both rope in for a great love story of that era? Other than Cindy, there is this girl called Liora who longs for Dilip like anything. So, is it going to be a love triangle or something else is written in their destinies. Who will meet and who will part away? To get all these answers, grab this short read. Being short in length makes this book easy to read and usage of Hindi and Bengali, in snatches, keeps the plot tight and riveting. The major USP of the book is the cultural tour and reality of Anglo-Indians aftermath the independence. Given the overall plot and story and backdrop, the author could have converted this short-length book into a full-length love saga.